I'm just not sure what's more comforting than a gratin. (Well, fine, a blanket, chocolate, and quiet — I suppose.) Seriously though, there's just something about melting cheese, breadcrumbs, and a creamy texture that makes people feel good. 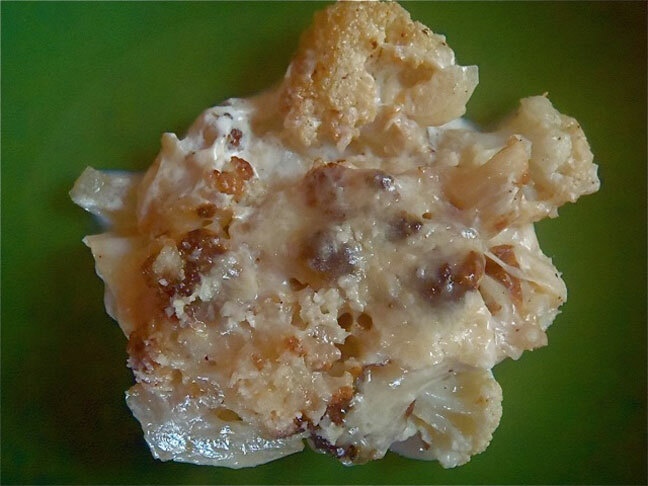 Though a vegetable is featured here, this dish is quite reminiscent of macaroni and cheese! This is truly delicious! This takes about 30 minutes to make, and once you've made it, you'll have enough to accompany a few dinners! Preheat the oven to 500 degrees. (Yes, you read that right. The very high heat is crucial in making this so delicious!) Cover a baking sheet with foil and evenly pour half the olive oil on it. Fill the baking sheet with the cauliflower, drizzle with the remainder of the olive oil, and season generously with the salt. 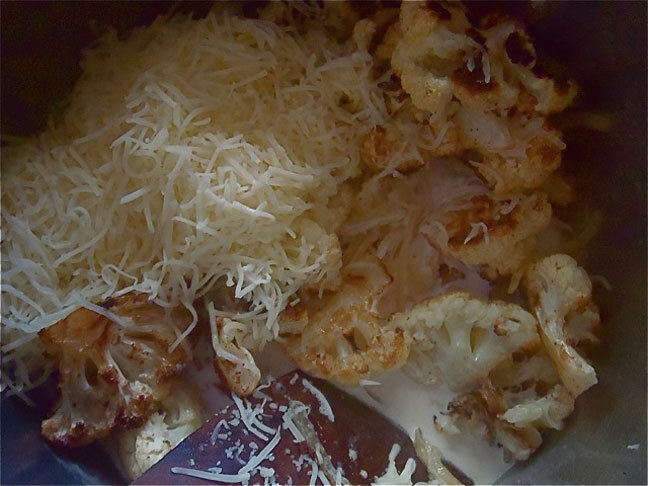 Roast in the preheated oven until the underside of the cauliflower is nicely browned, about 10 minutes. Turn the cauliflower over and do the same to the other side, for about 10 more minutes. While the cauliflower is roasting, coat a medium-sized saute pan over medium-low heat and add the onion and garlic. Cook until the onion is soft, about 5 minutes. Then in a large mixing bowl, add the cooked onions and garlic to the half and half, cheese, nutmeg, and salt. Once the cauliflower is done, reduce the oven temperature to 375 degrees. Add the roasted cauliflower to the cheese mixture and stir everything to combine. Pour the mixture into a 2-quart, rectangular baking dish, sprinkle evenly with the breadcrumbs and Parmesan, and bake for about 10 minutes, just until the cheese is nicely melted. You can do this recipe with broccoli, too (or a combination of cauliflower and broccoli). Use my Roasted Cauliflower and Broccoli recipe as a guide for the roasting. And as always, I use gluten-free bread crumbs for my family (my 6-year old and husband are gluten-free). You can buy gluten-free bread crumbs at Whole Foods.